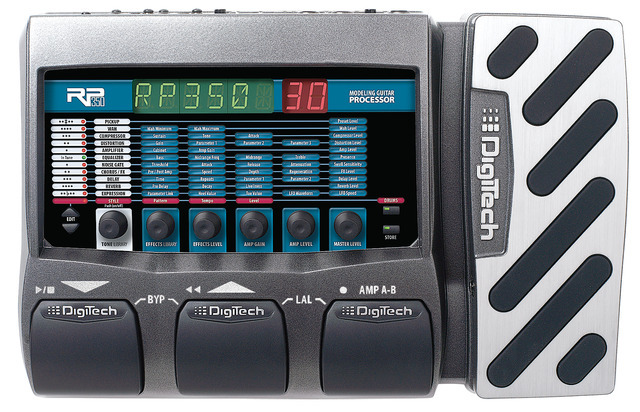 The RP350 guitar multi-effect processor now includes Cubase LE4 music production software. Now you can easily arrange, record and produce your own music on your PC or MAC. The RP350 gives you guitar tones from jazz, blues and rock to full out metal -- all recordable directly to PC or Mac via the RP350's USB streaming output. Cubase LE4 is not only a top-notch 48 channel recording DAW, but includes VST instruments like the HALion soft synth completing your recording experience. Now more that ever, nearly unlimited guitar tones are obtainable while other instruments are at your fingertips -- it's time to create your hit record! *Ibanez Tube Screamer, Voodoo Labs Sparkle Drive, Guyatone Overdrive, ProCo Rat, MXR, Boss Metal Zone, Roger Mayer Octavia, Demeter Fuzzulator, Arbiter Fuzz Face, EH Big Muff Pi, Dunlop Cry Baby, Vox, Clyde McCoy Wah, MXR DynaComp, TC Electronic, EH Electric Mistress, EH Small Stone, Boss Octaver, Unicord Univibe, Fender Opto Tremolo, Vox Bias Tremolo, Maestro Echoplex, Fender Twin Reverb, EMT, Fender Tweed Deluxe, Fender Bassman, Fender Blackface, Twin Reverb, Marshall Super Lead, Mesa/Boogie, Hiwatt, Fender Tweed Champ, Soldano, Jensen Blue Backs, Celestion, Johnson Amplification, VHT Amplification, Sunn, and Randall are trademarks of their respective companies and are not associated or affiliated with Digitech or Harman International Industries, Incorporated. The sounds of these competitors¹ products were reviewed in the creation of this product. The use of trademarks describing the competitors¹ products is intended solely for identification and comparison purposes. DigiTech¹s competitors have not approved of or endorsed either such use or the DigiTech RP500 Integrated Effects Switching System. ©2008 Harman International Industries, Inc. All Rights Reserved.